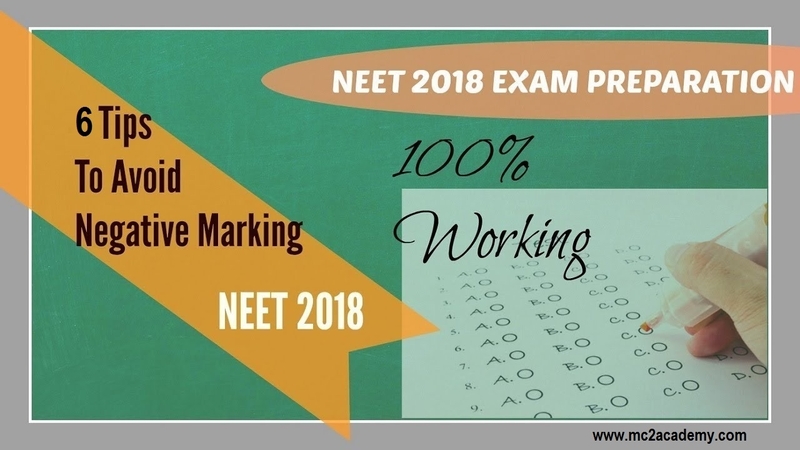 NEET 2018 Exam is conducted on 6 May 2018 by CBSE Board in this year. A huge Number of candidates apply for this Exam. Its India’s one of biggest tough & competitive Medical Entrance Exam. To get admission in India’s top medical institutes you not only need to crack NEET Exam but also require achieve good score. In this NEET exam you have to face Negative marking system for every wrong answer 1 mark in deducted from the total score. Each & every mark will helps to make high score that helps to get medical seat in this huge competition. Negative marking can make big differentiation between the average and good score. 1. Start with Relax and Stressless Mind: Aspirant feels stressful and tense when they get question paper in hand and realize that they don’t know the answer of few questions. Because of this they lose focus and fail to answer the question properly that they know perfectly. So try to feel relax and tense free in the exam to achieve great focus for good score. 2. Read Carefully Question and Answer Options: When you start answering to questions first read and understands that question properly. In many cases we feel the question asked in exam is similar to question that we practiced, but there are minute changes are done in exam questions. After that go for selecting correct answer options. 3. Be Confident Instead of Overconfidence: It’s always good to be confident instead of overconfidence. There is very small gap between confidence & overconfidence. Some student get excited and attempt answer carelessly. This thing directly impact on your score. So read every questions carefully and answer this with full of confidence. 4. Avoid Attempt of Doubtful Questions: Try to avoid answering of those questions on which you have less confidence. Keep in mind every wrong answer deducted 1 mark from whole score. It’s better to skip the doubtful questions instead of attempting it to avoid negative marking. 5. Follow the Guidelines of NEET: Carefully follow all the guidelines of NEET while attempting the Exam. For example fill the circle on OMR sheet properly, don’t select two answers for any question on the OMR sheet. It’s lead to avoid Negative Marking. 6. Don’t try luck testing: Some student answer the questions without knowing the perfect answer or without reading it. They try luck testing by blindly answering the questions and attempting questions without knowing proper answer. Avoid answering of questions like this to not only reduce negative marking but also achieve correctness in your problem solving. Hopefully, these tips are useful to all NEET candidates for facing NEET Exam. All the best to all NEET aspirants!! Our wishes are always with you. Give your best performance to achieve best result to complete your ambitions.